When X-ray photons strike a surface, they cause the emission of electrons. This, of course, is the basis of the XPS technique. If the surface is electrically insulating then the emission of electrons causes a positive charge to accumulate at the surface. When a non-monochromated source is used for XPS analysis there are usually a sufficient number of electrons in the region of the sample to limit the effect of the charging. However, when using a monochromated X-ray source for XPS measurements, there are too few stray electrons to control the charging and the resulting positive charge severely affects the XPS spectrum. It causes the peaks in the spectrum to shift to high binding energies and become distorted. For this reason, it is necessary to neutralise the charge on the surface by replenishing electrons from an external source. This stabilises and controls the charging to within a few electron volts of the neutral state. Any remaining small shift can be removed after data collection is complete, by using the spectrum processing tools contained within the Thermo Scientific Avantage data system. The use of a single gun to produce both the focused low energy electron beam and the large area ion flux has a number of distinct advantages over the use of independent sources. 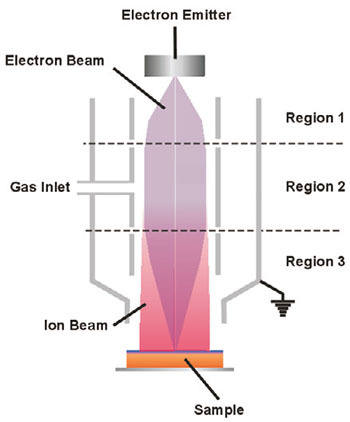 A new, combined ion/electron gun has been designed which incorporates all the above advantages. This novel design uses a LaB6 emitter to produce a bright source of low energy electrons, with an energy spread of only about 0.3 eV. These are focused to a small spot on the sample. Precise alignment to the X-ray beam is provided using integral X-Y deflectors. Focusing and alignment of this low energy beam is enhanced by the extremely low residual magnetic fields present in the mu-metal analysis chambers. Electrically inhomogeneous samples are typically prone to charging: minerals, ceramics, fibers, polymers, biological materials and so on. Semiconductors are spontaneously oxidized when exposed to air and are thus coated by insulating layers.